Thanks to a particular species of algae that is naturally bioluminescent, you can now wear living jewelry that glows in the dark. The piece above is a part of a collection called The Mermaid’s Lunchbox, and is a collaboration between culinary duo Sam Bompas and Harry Parr, scientist Simon Park, and jewelry makers Goldie Rox. The unique necklace features a small glass vial hanging from a gold chain. Within the vial is a tiny algae habitat, where a bloom of dinoflagellates swim in water. Dinoflagellates are a naturally bioluminescent type of algae that glow when agitated, so anytime you shake the vial, the necklace will glow bright with blue light. This particular type of algae occurs naturally too, which explains the freaky blue glow beach-goers sometimes see in the ocean at night. Scientists believe that the algae’s bioluminescence is a defense mechanism to protect them from predators in the wild. Shaking the pendant will activate the algae’s glow, but Bombas and Parr say that normal movement while wearing the necklace will activate sparks of bright algae glow. Simon Park is a professor of molecular biology at Surrey University, where the team worked to create an algae culture that could be inserted into the water-filled pendant. As long as the necklace is exposed to light during the day, the algae uses natural photosynthesis to recharge so it can glow all through the night. If that wasn’t enough of a reminder that the necklace is a living organism, each Mermaid Lunchbox piece will come with instructions on how to feed and take care of the dinoflagellates. The scientific side of the Mermaid’s Lunchbox team is busy searching for a more powerful strain of dinoflagellates, which they admit they may have to genetically modify themselves. In the meantime, they predict that each bloom of algae will live for up to three weeks if cared for properly, and the company will send refills as each bloom dies out. 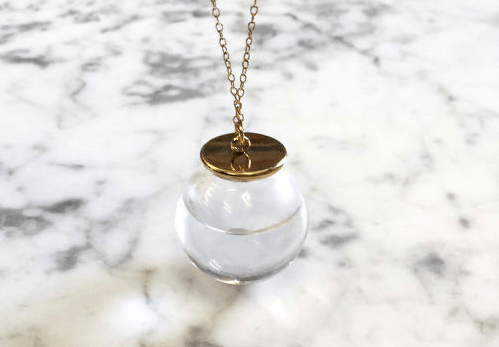 It’s not clear if the refills will cost extra, but at $2,800 per necklace, we certainly hope they’ll send refills for free.